We were in a hurry. Everyone was in a hurry. This hurry is characteristic of a gold rush, and especially so of the Klondike rush of ’97. October was at hand, the land covered with snow, the river threatening to freeze up at any moment, and Dawson still hundreds of miles to the north. Never in the history of all the Northland had such wild risks been taken, and never had it been penetrated by a more reckless company of men. The Klondike veterans who had come out with glowing accounts and heavy bags of Arctic gold, and who were responsible for the wave of adventure that swept over the land, laughed at us when we said we would pack our outfits over the passes and boat them down to Dawson in the fall of the year. But we did do it, and when we arrived at Dawson, several thousand strong, in the mist of snow storms and ice jams, the resident population was astounded. Conversant as they were with the terrible hardships of such a journey at such a time of the year, they had never dreamed that it would be attempted, much less successfully carried out. Naturally, some fell by the way, others were frozen in from one end of the river to the other, thousands, worn out and disheartened, turned back from the passes; but out party was numbered among the lucky. And this, by showing how great was the understanding and how pressing the necessity, having once started, of going through, brings me to the narrative proper – the running of the Box Canyon and the White Horse Rapids. To show the deep respect felt for these places by the Old Timers, I quote from Miner W. Bruce, an Alaskan pioneer, whose book we consulted throughout the trip. Midway in this mile of canyon, the walls open out on either hand, like an immense circular court. The water dashes into this, forming a mighty maelstrom. It is said that in former years two Swedes were caught in this whirlpool. Their boat was most seaworthy, and at first they tried to get out; but failing in this, they took turns in bailing and praying, and waiting for something to turn up. Round and round they dashed for some four hours, and then, by a peculiar freak of the waters, were whirled on down the canyon, finally escaping with no damage done save to their nerves. Tying our boat, the Yukon Belle, in the eddy above the Box, my three comrades and myself walked ahead to investigate. Hundreds were portaging their outfits on their back. For us this would mean two days of severest toil, while if we cared to take the chances and run through, it would mean only two minutes. According to our custom, we put it to the vote, and the latter method was unanimously carried. Lashing the steering oar so that it could not possibly escape, I allotted my comrades their places; for I was captain. Merritt Sloper, direct from adventures in South America and who knew a little of boating, took his position in the bow with a paddle. Thompson and Goodman, landlubbers who had never towed before this trip, were stationed side by side at the oars. That the run may better be appreciated, it is well to explain that our twenty-seven-foot boat was carrying over five thousand pounds in addition to human freight, and hence did not possess the buoyancy so requisite for such an undertaking. “Be sure to keep on the Ridge, ” cried the men on the bank as we cast off. The water, though swift, had a slick, oily appearance until we dashed into the very jaws of the Box where it instantly took on the aspect of chaos broken loose. Afraid that the rowers might catch a crab or make some other disastrous fumble, I called the oars in. Then we met it on the fly. I caught a glimpse of the spectators fringing the brink of the cliffs above, and another glimpse of the rock walls dashing by like twin lighting express trains; then my whole energy was concentrated in keeping to the Ridge. This was serrated with stiff waves, which the boat, dead with weight, could not mount, being forced to jab her nose through at every lunge. For all the peril, I caught myself smiling at the ridiculous capers cut by Sloper, perched in the very bow and working the paddle like mad. Just as he would let drive for a tremendous stroke, the stern would fall in a trough, jerking the bow clear up, and he would miss the water utterly. And at the next stroke, perhaps, the nose would dive clean under, almost sweeping him away – and he only weighed one hundred pounds. But never did he lose his presence of mind or grit. Once, he turned and cried some warning at the top of his lungs, but it was drowned in the pandemonium of sound. The next instant we fell off the ridge. The water came inboard in all directions, and the boat, caught in a transverse current, threatened to twist broadside. This would mean destruction. I threw myself against the sweep till I could hear it crackling, while Sloper snapped his paddle short off. And all this time we were flying down the gutter, less than two yards from the wall. Several times it seemed all up with us; but finally, mounting the Ridge almost sidewise, we took a header through a tremendous comber and shot into the whirlpool of the great circular court. 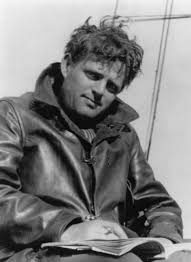 Ordering out the oars for steerage-way, and keeping a close eye on the split currents, I caught one free breath before we flew into the second half of the canyon. Though we crossed the Ridge from left to right and back again, it was merely a repetition of the first half. A moment later the Yukon Belle rubbed softly against the bank. We had run the mile of canyon in two minutes by the watch. Sloper and I walked back by way of the portage and ran a friend’s boat through. This was quite ticklish, for the little craft was but twenty-two feet over all, and proportionately heavier than ours. Then we bailed out and ran two miles of ordinary rapids to the head of the White Horse, passing several wrecks in which a number of lives had been lost. Of the two the White Horse was more dangerous than the Box. Save for a few who had been drowned, it had never been run in previous years. It had been the custom to portage everything around, even to the boats, which were skidding along on spruce tree trunks. But we were in a hurry and rather enthusiastic over our previous good luck; so not a pound was taken from the boats. The dangerous point in these rapids is at the tail end, called the “Mane of the Horse,” from a succession of foamy, mountainous waves. Extending three-quarters of the way across, a rocky reef throws the whole river against the right bank; then comes the jump, and it is thrown back to the left, forming another whirlpool, more risky by far than that of the Box. When we struck the “Mane,” the Yukon Belle forgot her heavy load, taking a series of leaps almost clear of the water, alternating with as many burials in the troughs. To this day I cannot see how it happened, but I lost control. A cross current caught our stern and we began to swing broadside. Then we jumped into the whirlpool, though I did not guess it at the time. Sloper snapped a second paddle and received another ducking. It must be remembered that we were traveling at racehorse speed, and that things happened in a tithe of the time taken to tell them. From every quarter the water came aboard, threatening to swamp us. The Yukon Belle headed directly for the jagged left bank, and though I was up against the steering sweep till it cracked, I could not turn her nose downstream. Onlookers from the shore tried to snapshot us, but failed to gauge our speed or get more than a wild view of angry waters and flying foam. The bank was alarmingly close, but the boat still had the bit in her teeth. It was all happening so quickly, that I for the first time realized I was trying to buck the whirlpool. Like a flash I was bearing against the opposite side of the sweep. The boat answered, at the same time following the bent of the whirlpool, and headed upstream. But the shave was so close that Sloper leaped to the top of a rock. Then, on seeing we had missed by a couple of inches, he pluckily tumbled aboard, all in a heap, like a man boarding a comet. Though tearing like mad through a whirlpool, we breathed freer. Completing the circle, we were thrown into the “Mane,” which we shot a second time and safely landed in a friendly eddy below.